As a librarian in the University of Queensland (UQ) Library’s Learning and Research Services team, I work directly with academic staff and students, and I believe that accessibility awareness needs to be present in everything we do. Universities have policies stating their commitment to equity for students and staff with a disability; when it comes to published material, it is often libraries who have the role of delivering on this commitment in practical terms. For example, will a student with low vision be able to access the wider reading required for an assignment, in a format they can use? Will a lecturer who is blind be able to search subject databases and connect to articles and e-books in his or her field? Members of the university community with a print disability have the right to expect practical and timely access to their libraries’ collections. This is an ongoing challenge for libraries when we create resources and when we purchase access to electronic resources whose accessibility standards are outside our control. There are encouraging signs that we are moving away from a situation where the default was an inaccessible copy which needed to be reformatted so a person with a print disability could use it. The move is towards the adoption of universal design, so that e-books and other publications may arrive in a library’s collection already in formats that everyone can use. But we’re not there yet. E-books hold out a great promise for readers with a print disability. Digital text is by nature more flexible than print on paper, and it should be straightforward to enlarge the text and “reflow” it to stay on the screen, change the font or the colour, or read the text aloud in a synthesized voice, using text-to-speech or screen reader software. These options can make all the difference for readers with a print disability, allowing them to work independently, to access books without delay, and to make fuller use of their libraries’ collections. The technology is already there to deliver these capabilities. But this great promise is frustrated when e-books are not provided in accessible formats, or when the e-book platforms contain obstacles to the use of assistive technologies, such as screen readers. 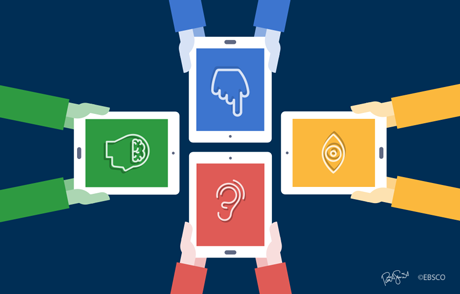 In 2017, the University of Queensland Library carried out a project to explore e-book accessibility, testing e-books from 14 platforms which students commonly encounter at UQ. Each platform was tested twice: first by a sighted librarian, using audit questions developed by Jisc’s Ebook Audit 2016 and very kindly shared with us; and second, by two blind research technicians using the screen readers NVDA and VoiceOver. We found big differences in accessibility between platforms, as well as many obstacles for screen reader users, which sighted library staff would not have been able to detect. For the librarians doing this testing, it was our first experience examining an e-book from an accessibility perspective, so it was an excellent learning exercise. We learned which features contributed to e-book accessibility and developed a checklist to inform purchasing decisions. For the librarians doing this testing, it was our first experience of examining an e-book from an accessibility perspective, so it was an excellent learning exercise. We learned which features contribute to e-book accessibility and developed a checklist to inform purchasing decisions. The screen reader obstacles we encountered taught us that libraries really need e-book providers to test their products using assistive technologies. In my view, it is unrealistic to expect libraries to carry out their own accessibility testing before purchasing an e-book package; however, it is quite reasonable to expect e-book publishers and platform providers to test their own products with assistive technologies as part of their product development. With some platforms we could only ask: if the provider had tested the product with a screen reader, could they really have allowed the obstacles to stand? When the testing was complete, we sent the results for their own platforms to each of the publishers and aggregators, plus videos of some of the screen reader difficulties, and asked if they would be interested in follow-up conversations. The responses were very positive, and we learned about further work e-book providers are doing in this area which we wouldn’t have been aware of from their webpages. We really appreciated the email exchanges we had with many of the providers, and international phone calls across time zones with some, including EBSCO and JSTOR. As a direct outcome of the project, a statement has been added to UQ Library’s Collection Management Policy, to say that we prefer more accessible formats in our purchasing. An accessibility checklist has been adopted and incorporated in purchasing procedures. 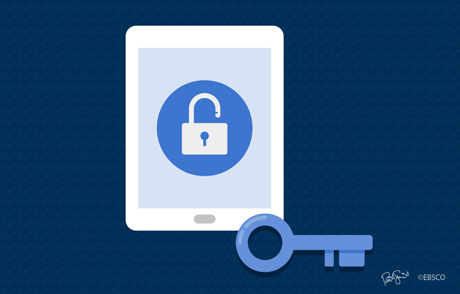 We look for platforms which provide HTML or EPUB, as well as accessible PDFs, those which offer downloads free of Digital Rights Management (DRM), those which provide accessibility features in their read-online mode, and which have been tested with assistive technologies. 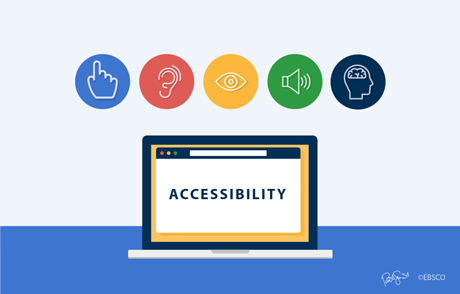 We also look for platforms which provide comprehensive accessibility information on their webpages. Libraries need this information so that we can support our clients with print disabilities. Jisc’s ASPIRE project has done very valuable work in 2018 to clarify for providers what libraries need to know about their products’ accessibility features and to encourage and recognize e-book providers whose webpages do this well. Congratulations to EBSCO for ranking first among the aggregators in the ASPIRE audit, and to Palgrave Macmillan for coming in first among the publishers. 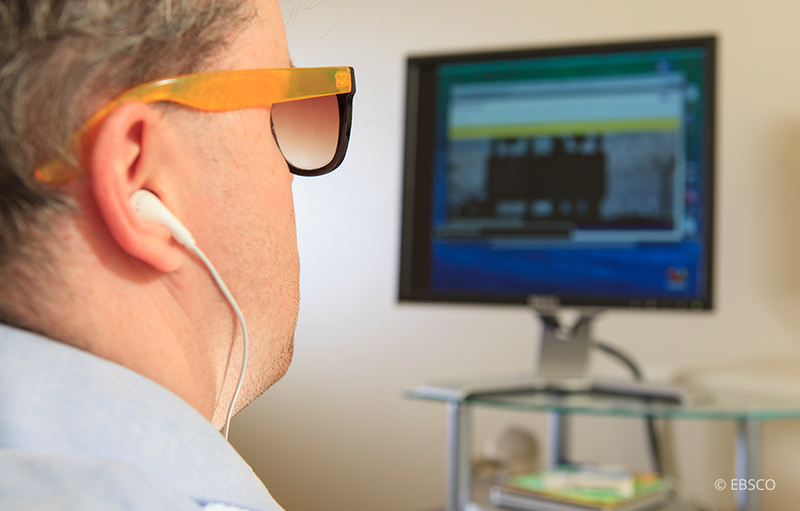 In 2018, an “Accessibility Snapshot” was carried out by Jisc for the University of Queensland. Using a “dummy” student login, the Jisc testers explored a university’s main student-facing sites, to see how well they would work for a student with a disability, and provided short- and long-term priority recommendations. An implementation plan for UQ’s “Snapshot” report is being developed, and will form part of UQ’s Disability Action Plan 2018-2021. In the second half of 2018, UQ Library created Digital Essentials, a set of new digital literacy modules, freely available on the Library webpage. I am very pleased to say that they include a module on Accessibility and Study Hacks. A paper on the e-book accessibility project entitled “Doing our part to end the ‘book famine’: UQ’s E-book Accessibility Project”, will be presented at the ALIA Online conference in February 2019. Pam Schindler is a liaison librarian with more than 20 years of experience, working at the University of Queensland Library in Brisbane, Australia. She is convenor of the Library’s Accessibility Working Party and a member of the UQ Disability Inclusion Group.